11th Battalion AIF is a commemorative Living History Unit dedicated to remembering Western Australia's involvement in World War One. 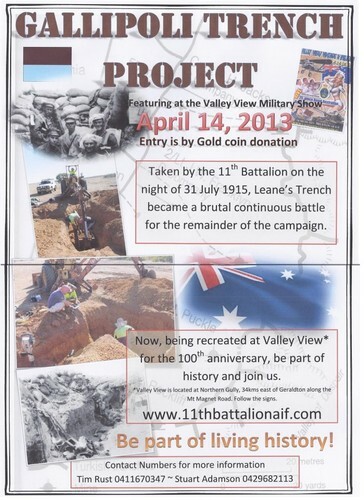 We are also embarking on a huge project to recreate a trench system that became known as Leane's Trench after the Capt who led the 11th on the night of 31st July 1915 to take it from the Turks. The trench will be an all sensory experience, with actors, sound, and all the paraphernalia of trench warfare and life, 120m long and nearly 2m deep. Planned to be fully completed by 2015 in time for the Gallipoli centenary the small dedicated team aim to live up to the 11th Battalion motto: Deeds Not Words. Join us for a preliminary walk around while we narrate a brief history and explain our vision.